Did you know there are a lot of benefits related to being a septuagenarian? Think of all the discounts we get. When you check into a motel you can get your AARP discount even when you are not a member of AARP. They never ask to see your AARP card. I always thought AARP stood for the Advanced Aging Process. That shows you how “Arppie” oriented I am. You guessed it. I never did join that organization. Why bother? Did you know that since I became a senior my husband and I do a lot of matinees? Now, get your mind out of the gutter. I am talking about movie matinees. And, when we do the 11:00 matinee on Wednesday’s we not only get the movie discount, we get free popcorn with our discount club card. Whoopee. The only problem with this arrangement is we barely get through breakfast and here we are, at the movies eating popcorn. And, when we step outside after the movie we are blinded by daylight and can hardly find where we parked the car. That reminds me of another thing that we do on a regular basis. Very often Steve and I do Dunch. What, you say? You have never heard of dunch. Dunch is lunch and dinner combined. Again, let me say, there are a lot of benefits for the septuagenarians of the world and dunch certainly is one of them. Here’s what you accomplish when you do dunch. You first must check out with the restaurant what time lunch prices stop and……if it is three o’clock in the afternoon then it is a perfect place to do dunch. You will get lunch time prices and be able to eat your main meal of the day at a time when you can combine lunch and dinner. Better yet, sometimes we do dunch with lunchtime prices and with a coupon. We do that as often as is possible to maximize on the savings. Since we are on a fixed income sometimes we do free lunch. Let me clue you in on free lunch. Really, she said. I didn’t know they had a buffet bar. I then told her that we go there quite often on Saturdays and eat all the samples throughout the store and we call this our free lunch. And, very often some of the samples are much more than just bite size. So, don’t believe someone when they tell you there is no such thing as a free lunch. We get free lunch all the time. I would be remiss if I did not tell you that hubby and I also go to Sam’s club during the week just to get the oversized Nathan’s hot dog combo, a hot dog and a very large coke, for only $1.89. Don’t laugh; this is the way a lot of seniors survive on their meager fixed incomes. We not only get the combo, a hot dog and a large coke, but we buy an ala carte hot dog and share the large coke. Hey, a penny saved is a penny earned. One thing I have wondered is why the airlines ask you if you are a senior when you book on line. When I say yes the price is the same as for an adult so why ask. Well, I have since found out that you have to call before making your reservations in order to get the senior discount. That brings me to another airline problem. Are they in the habit of picking on seniors? Don’t forget, we hear a lot of stories about little old ladies being excessively frisked when going thru the checkout lines at airports. I have had the personal experience of having doctors prescribe very expensive drugs to us seniors when there may be cheaper generic drugs available. Once I researched a particular drug for an alternative more affordable replacement to a prescribed drug and I found that there were others that could have been ordered. When I called the doctor they left all of the other research to me. Like they told me to call my drug plan to see if they will cover the alternative drug. You would think the doctor would do this for you. They have all of that information at their fingertips. But, no such luck. I guess we septuagenarians need to find the time to do this kind of research ourselves. Hmmm. Speaking about research, did you know that a lot of restaurants offer senior discounts? Well, of course you have not heard of this because it is usually a secret and you are supposed to ask whether or not they give senior discounts at the register when you pay your bill. If you don’t ask, well, you guessed it – you will get no discount. A few restaurants that offer senior discounts all the time are Carraba’s, Bonefish Grill, Denney’s, and Outback. All that is needed at the register is your AARP card. Dunkin Donuts will give you a free donut with a large or extra-large drink and Burger King will give you a free cup of coffee with any purchase. 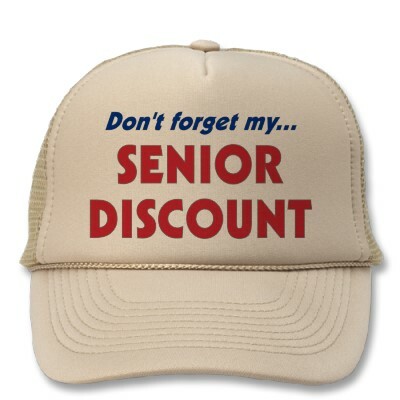 There are other things besides food where seniors can get discounts. Some retail stores offer senior discounts such as Bealls, Kohl’s, TJ Maxx and Stein Mart. Check with any of these to find out how their discounts work for seniors. For instance, at Bealls, you can get a 20% discount on the 1st Tuesday of every month. Grocery stores such as Albertson’s, Kroger’s and Publix offer senior discounts. Check with any of these stores to find out what day of the week or what day of the month that they offer these discounts to seniors. Cell phones, haircuts and movies are other things that you can hopefully get a senior discount on. And, of course, if your hospital plan offers Silver Sneakers, that is really a plus at most all gyms in the country because Silver Sneakers is a free membership to these gyms. Don’t get too excited because even though I give you this list of discounts for seniors does not mean that all of these places honor these discounts. Sometimes it is a local or a regional thing. But, the more you save the easier it will be on your fixed income wallet. Hmmm. Seniors tend to do a lot of free concerts and because I am an usher at the Theater I attend all the current theater in town for free. I merely pass out the playbills as folks enter the theater and when the show begins I am assigned a seat so that I may watch the entire show free of charge. I know a lot of seniors who do this just for the privilege of seeing free concerts and free theater etc. Not a bad gig I might add. The more you read about senior discounts the more you can appreciate the many advantages of being a septuagenarian.